Pamela Geller’s Atlas Shrugs Beats Little Green Footballs Hands Down……. – The Tundra Tabloids……. Pamela Geller’s Atlas Shrugs Beats Little Green Footballs Hands Down……. 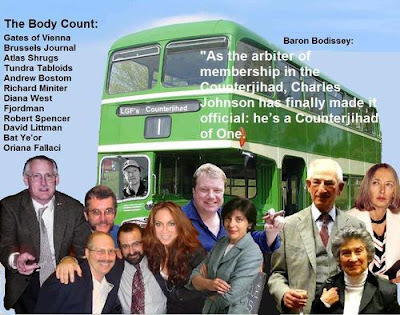 Actually, it was no contest, LGF was on the skids once Charles Johnson started driving his “lidil green bus”. THE WEBLOG AWARDS ARE OVUH! Ah …the sweet taste of victory. First, let me say I want to congratulate the first place winner, the Canadian blog that took first place, Small Dead Animals. WOOT! If Atlas didn’t have a horse in this race, I would have voted for Kate. She has a sharp blog (Canadian conservative) and she beat Ace! Poetic justice! Ace, snarky misogynist (this is the guy, when introduced to me at CPAC 2007, the first thing he ever said to me was ‘you got nice jugs ‘ – true story. Needless to say, it was the last time I ever spoke to him). ACE WAS BEATEN BY A GIRL. I love that. Sweeter still. Atlas beat LGF. Read that again. No one admired that blog more. I was crushed when he turned and came down against the counter jihad movement and smeared a racist label on a wonderful conference that included Bat Ye’or, author of Eurabia and Islam and Dhimmitude and Robert Spencer, author of The Politically Incorrect Guide to Islam (and the Crusades), David Littman, Dr. Arieh Eldad, member of the Israeli Knesset, Dr. Patrick Sookhdeo, Director of the Institute for the Study of Islam and Christianity, Sam Solomon, Director of Fellowship of Faith for Muslims and author of the Charter of Muslim Understanding, the great Norwegian essayist Fjordman, Dr. Marc Cogen, Ghent University, Dr. Andrew Bostom, author of The Legacy of Islamic Antisemitism, and Laurent Artur du Plessis, author of a forthcoming book on shariah finance, friends of Oriana Fallaci, and other brave leaders in this terrible war. The meme at LGF is that I embraced fascists because I would not rebuke Filip Dewinter’s attendance at the conference. The reality is Dewinter is not a fascist. Dewinter (years ago) said in Ghent, Belgium: “You should know, the real enemies of Israel today are not on the right, but rather on the left: the socialists and the Greens.” The leftist/Islamic death to the Jews marches that we have seen these last 10 days haave certainly validated his point. When LGF smeared that conference and me in the process, along with so many others, I thought it was the death of Atlas. He was huge, I was small. A year later, I am not small. He is. Previous Post Previous Post Helsinki Finland: Pro-Israel Rally Draws 2500 People……! Next Post Next Post Hamas Fires Its First Phosphorus Shell at Israel…….